We have had the coldest days here recently with so much rain and 'snow' that I am starting to wish for Spring. The little bulbs are starting to pop up in the garden and there is blossom on some of the trees around town. I have been sorting through my image files this week for some reference material for a client and I came across these images that I photographed in my home last Spring. I love lilac, isn't is the most amazing colour! The last couple of weeks I have been preparing my design for an event at Darling Harbour next month for one of my clients... Southern Highlands Corporate Events. Last night I hosted a gathering here in my studio to share my ideas and concept with the sponsers of the stand Milton Park, Peppers, Tertini Wines and Fountaindale Grand Manor.... just a few of some of the amazing hotels and vineyards in the Highlands. Andrew helped me prepare a small scale display of what it will look like, complete with miniature pieces of furniture. I will share it all with you over the next month as I build, create and produce it. There is a lot of sewing to do, sets to make, shopping and many things to prepare. It's still has to remain a secret until the show begins.... but if you're passing through the Southern Highlands do drop in ...especially if you can sew!! Wishing everyone a fabulous day!! 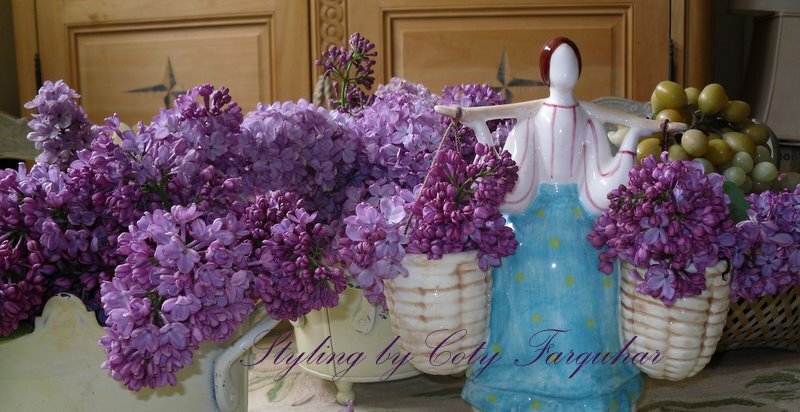 Lovely lilacs! I really wish they grew this far south. Maybe one day I'll be able to see some blooming in person. Lilacs are, without question, one of the most beautiful and fabulously fragranced flowers on the face of the earth. I love them, and they look beautiful in your post! Sorry you guys are experiencing such cold, rainy weather. We're experiencing triple digit weather with high humidity levels here in the Midwest (USA). I'll trade ya! ;-) Have a great weekend, and stay warm! Hello my sweet friend. The mention of lilacs takes me back to childhood, when my mother would take my little brother and me on "tours" of her garden in the spring. Whatever was blooming always made its way to the center of the dinner table. Perhaps that's the source of my love of beautifully set tables with centerpieces comprised of fresh garden flowers. I'm certain your presentation was brilliant and awe-inspiring, and that your clients were as inpressed as I am at the depth of your amazing talent. I hope warm weather comes to you soon (as I'm wishing for a heat index here significantly below 100F!). How lovely your lilacs are! I hope you have a beautiful and delightful Spring ahead -- always welcome after the dreary winter months. Wishing you a speedy Spring! I love lilics too! They smell heavenly. I love all your pictures. I am sure your client will love everything you have prepared. We know you are super talented! Me Too! Can't wait for the spring fragrances in the garden, but i must say the hellebores and daphne sort of take my breath away, but roll on spring time for me too. I have to tell you that I have just spent at least 1/2 hour looking through your photos. Just beautiful, the colors and subjects. You are a wonderful photographer. I can sew....straight lines! Wish I could snap my fingers and I would be at the shop in a flash...with thimbles on! Good thing you are busy busy. Spring will come sooner that way. Thinking of you as I die in this heat! hope all is going fantastically well for you at the Darling Harbour event, I'm sure your design for Southern Highlands is the best ever!